Sun-dried tomatoes come from Italy where Italians dried tomatoes on their roofs to maintain the brightness and flavor of tomatoes all year long. As we have tried to replicate the flavor in the United States, sun-dried tomatoes get mixed reviews. Read a bit online and you get mixed reviews of dried tomatoes, both the loose ones and the tomatoes packed in oil. There are good reasons for the mixed reviews. 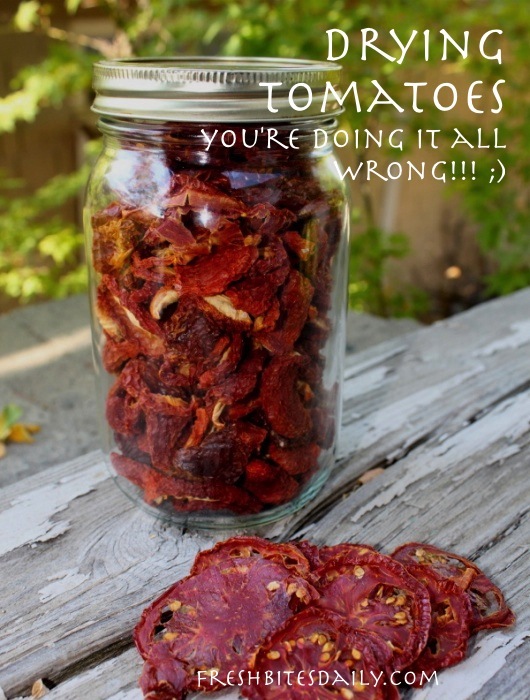 You will get the best results with your dried tomatoes by choosing a paste-type tomato. They have less liquid, denser flesh. Romas found in the groceries are paste-type, but use an heirloom if you can, like San Marzano or Amish Paste. 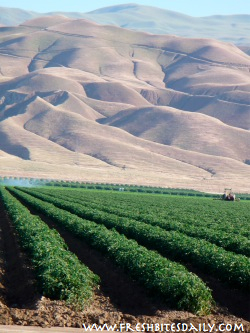 The grocery Romas were developed to make it as commercial tomatoes. One test they used in trials was dropping the tomato out a two-story building and not have it squish. Notice in the commercial tomato operation pictured here — the Romas get picked at the same time and piled into the bins of 18-wheeler trucks. The tomatoes on the bottom do not crush. If you drive along behind one of these trucks, you can see tomatoes bouncing out when the truck hits a bad bump. Tomatoes from several days of picking lay in a heap, fully intact. Part of me is tempted to glean this “vegetarian road-kill,” but of course they are Romas with little flavor. My criteria for a good paste tomato is flavor: San Marzano or Amish Paste are my top picks. Whether you go with the sun or with a dehydrator, remove the stem portion of the tomato and then cut it in half lengthwise. Each half will be a “cup-like” shape. Place your tomato halves cut side up, using the skin to form a cup to maintain the juices. The juices are important. This is where some of the flavor comes from. As the tomato dries, the juices will remain in the cup and your dried tomato will be that much more intense in flavor. 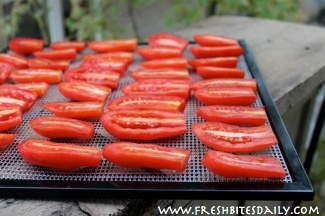 If you have tried drying slices of beefsteak tomatoes and were disappointed, it is likely because you lost most of the juice to your dehydrator sheets. If all you have are beefsteaks and the flavor is good enough to try to preserve, try making tomato leather instead. What will you do with all of those tomatoes? One easy way to store them is actually to powder them. We outline a process here for homemade tomato powder. That tomato powder is then a slick ingredient to add to some simple soups that you can make year-round. Here are three ideas to get you started. Hi, I was interested to read your post about sun dried tomatoes, and I wondered if there was an alternative to drying out via the sun…(not much sun in Holland! ), or using a dehydrator (wouldn’t know where to start in acquiring one of those!). I wondered if drying out in a low temperature oven would do the trick? I’m always looking for ways to use my home grown tomatoes usefully, such as in the winter and this would be a perfect way of storing them after harvesting. I think it would be difficult to get them to dry without molding if you don’t use a bit of heat. I always dried my tomatoes in an oven. Turned out great. Almas I always dry my tomatoes in the oven and then put into sterilized bottle with Olive Oil and salt and pepper and then use in sandwiches, add to my curry. It taste great and organic bounty from the garden.